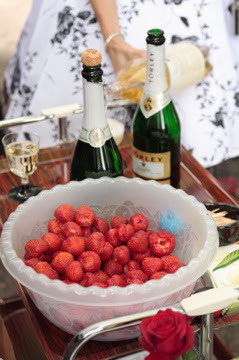 On July 12th my friends Anna and Patrik got married. Unfortunately Miss Meadows had forgotten to load the batteries in her camera, and had to wait for some pictures to arrive from the wedding photographer (my sister Christine Engström) before she could blog about it...Yesterday I got the photos though, so here we go! For the occasion I wore a repro 50s plum colored wiggle dress from Bettie Page Clothing. I felt that the vintage lilly of the valley hat I wore at Fanny's and Michael's wedding earlier this summer was the perfect wedding hat, so it got to come along to this one too. The bride and groom matched each other very well! Anna had sewn her dress herself, done her hair herself, made the fascinator she wore in her hair herself, and put together the bridal bouquet herself. I'm impressed! 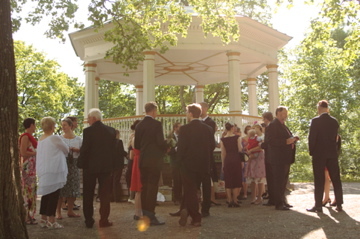 The wedding took place in a pavilion in Vitabergsparken in Stockholm, and the weather was perfect!